Chelsea manager Maurizio Sarri has attempted to explain his side’s latest defeat as they were well beaten 2-0 away to Everton on Sunday. The Blues now face a real fight to finish in the top four after another setback at Goodison Park, with goals from Richarlison and Gylfi Sigurdsson doing the damage. Despite the result, Sarri feels Chelsea played a very strong first half before for some reason tailing off in a phenomenon he described afterwards as being ‘very strange’. This is not the first time the Italian tactician has struggled to understand his players’ dip in performances as he seemingly fails to motivate his team or get them to fully understand his instructions. ‘I don’t know. The player don’t know what happened. At the moment I don’t really explain the change. We played in my opinion the best first half of the season. We could have scored four or five times. Suddenly we stopped to play. 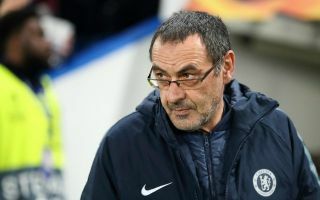 It’s very strange,’ Sarri told Sky Sports in their coverage of the game, as quoted by the Metro. ‘We stopped to defend, to counter-attack, to everything. We had only to continue, I think. We were in control of the match. We played very well and needed to continue. It’s worth noting it took time for Sarri to get Napoli playing the kind of football that made him such a success there, but he’s unlikely to get that kind of time at Stamford Bridge. Chelsea owner Roman Abramovich is not known for giving managers long after bad results, and the Express already suggest Sarri could be shown the door during the upcoming international break.